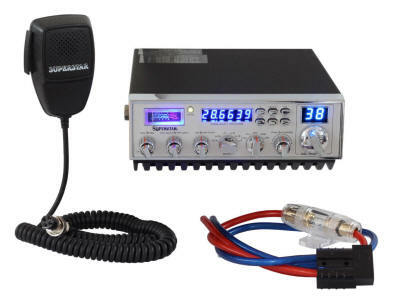 The SS-158FB4 is a reliable 10 meter AM-FM-SSB-CW mobile radio. With 400 watts peak AM, 100 watts RMS FM-CW, 400 watts PEP SSB, it provides high performance along with features such as a 6-digit frequency counter, Mic/RF gain, and dual finals. The SS-158FB4 has dual echo control and talk back switch along with a blue frequency counter, channel display and meter. Designed for easy mobile operation, an affordable price tag, and backed by Ranger’s 1-year factory warranty, the SS-158FB4 will answer your needs for SSB mobile operation. The Superstar SS-158FB4 has a classic look and all the power you need. The final amplifier section features four (4) 2SC2879 transistors. High power SSB mobile radio. Install Nitro Knobs with dimmer control integration circuit built so it dims with the factory adjustment. 7 Knob set parts and labor.